From Jack Nicholson to Heath Ledger, we have had some brilliant and varied depictions of the Joker over the years, with each new actor bringing a new perspective. 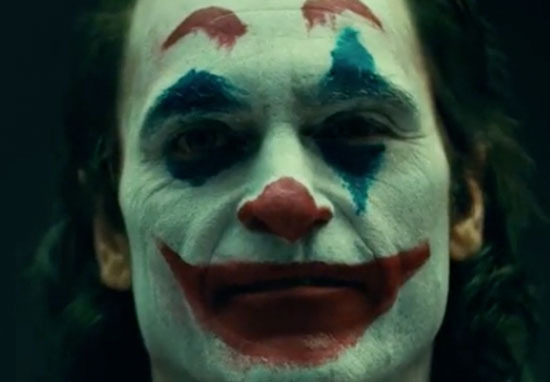 Now we have been given a little glimpse as to what we can expect from Joaquin Phoenix as he takes up the title role in Joker. Director and screenwriter Todd Phillips (The Hangover) has shared a video via Instagram of Phoenix wearing smeared Joker face paint and a sardonic grin; set to The Guess Who’s track Laughing (1969). The brief video flashes between Phoenix wearing a beige, humdrum outfit and make-up clean face to full maniacal Batman villain visage; complete with garish suit and bedraggled green hair. This is only a brief glimpse as to what we can expect, but fans are already pleased with Phoenix’s depiction. Omg, yes. So wonderfully chilling. Joaquin will be perfect. Can’t wait! At first glance I disliked it. Now I can’t stop watching. He’s a mixture of Romero’s and Ledger’s Joker. Can’t wait to see this in theatres. Bravo . Intriguingly, many fans believe Phillips has let them in on the Joker’s origin name, as the video is captioned with the name ‘Arthur’. It has previously been rumoured the Joker will go by Arthur Fleck in the new movie, and this humanising detail now appears to have been confirmed. Precious little is known about this movie so far, although it is understood the action will take place in 1980’s Gotham. Warner Brothers have described the film as an ‘exploration of a man disregarded by society [that] is not only a gritty character study, but also a broader cautionary tale’. It is speculated Alan Moore and Brian Bolland’s dark graphic novel The Killing Joke (1988) will be one of the primary sources for the plot. Critically revered The Killing Joke depicts the Joker as a failed comedian whose marriage collapses and whose face is disfigured during a botched robbery he commits while trying to make enough money to live. Oh this is going to be gooooood. Someone tell @JaredLeto and @DavidAyerMovies you can give the Joker a different, edgy look, without destroying the roots of character. Joker is a clown, not a street pimp. I wouldn’t quite classify this as like any genre. I wouldn’t say it’s a superhero movie, or a studio movie or a … It feels unique, and I think more then anything, and probably the most important thing, is Todd seems very passionate about it and very giving, and so that’s exciting. I think, underneath the excitement of these films, and the size of them, there are these incredible characters that are dealing with real life struggles. And sometimes that is uncovered and exposed, and sometimes it isn’t, and so I always felt, like, there were characters in comics that were really interesting and deserve the opportunity to be kind of studied. And so I think that’s what Todd sees appealing about this idea. Joaquin Phoenix in #Joker makeup from a camera test. Acting alongside Phoenix is an all star cast, including Robert De Niro, Frances Conroy, Marc Maron and Zazie Beetz. Joker will hit UK cinemas as of October 4, 2019, giving comic book fans plenty to smile about.